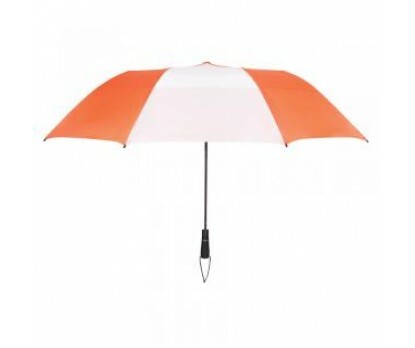 Personalized orange & white 58” arc vented economy umbrellas have forged success for those marketers, who had utilized them during outdoor promotions. This umbrella shows up easily at a crowded market place. Promotional orange & white 58” arc vented economy umbrellas make a great choice for marketers having either of these colors in their themes or who are working in niches, which have close affiliation to these colors. Indeed custom orange & white 58” arc vented economy umbrellas are head turners, but they are brave wind fighters, too. Features - windefyer vented canopy, nylon fabric with orange and white strips, windproof frame and colorful shoulder strap sleeve. Dimensions - 58" arc - Closes to 22". Imprint area - 10"W x 6.5"H.